FINS WINDTAMER is also 100% Spectra Braid, but with additional processing. Windtamer Braid has been treated by means of a proprietary process resulting in a compacted round and smooth structure with a firm body. This enables Windtamer to pack very well on reels without pulling into itself and cut through the wind to cast without air knots and rod tip wrapping. Saltwater inshore fishing is a situation where Windtamerstands out. Windtamer is great for those who find it difficult to use Superlines in windy conditions. Its firm structure allows the line to slice through the air with minimal arching. It packs on the reel to minimize backlashing and FINS Windtamer Braid offers the best strength-to-diameter-ratio of any line. Great for both bait and spinning reels. Not only does theWindtamer cut through the wind much more efficiently, it also allows for a much further cast in the process. Obviously, this allows for a stealthier approach to some of the most “spookish” species of inshore angling on the flats anywhere in the world. While spooling the Windtamer, the wax-like build up does not accumulate on the guides or the line tensioner on a spooling machine as most brands seem to have this problem. 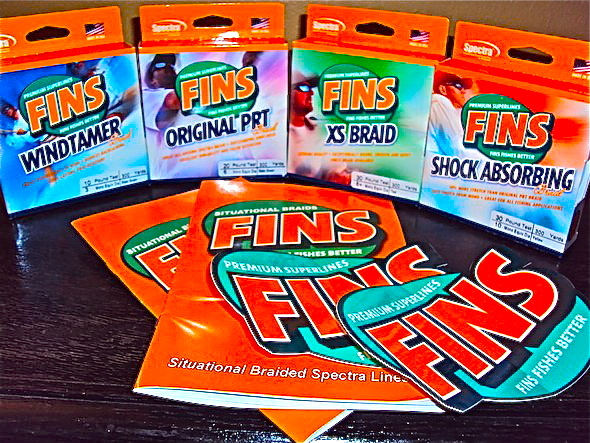 FINS has resolved this issue by coating each one of the four fibers of Spectra and the final braided line as well, allowing the line to be hydrophobic and does not absorb water. Some of the dye in the line may bleed but amazingly, it seems to not affect the color as most braids tend to fade. BBS TECH has gone the extra mile with FINS and the evolution of Super Braids has taken the next step in braided line technology and has brought it to the world. We have a beautiful but windy morning at the inlet. Winds are blowing out of the East-Southeast at 15 mph and gusting to 20. We received an update from inlet regular Mike Ricciardi of Vero Beach who was out on the north jetty this morning and reported another slow day, so far. Mike reported 3 or 4 Spot Porgy's, Tony Swiderski of Sebastian landed a small C/R Snook in the early hours. Mike White of Sebastian had a big hook up that just couldn't be stopped that finally broke off; they are thinking it was probably a Goliath Grouper. Occasionally, waves are coming over the end of the jetty and Mike and Tony were "baptized" pretty well. Take your rain gear if you head to the inlet! We received a night update from Nam Bui of Orlando who fished the inlet last night with Phillip Ping and Thang Nguyen. Phillip had what appeared to be a slot Snook on the line but it wrapped itself up in the rocks and broke off. Nam hooked up with something quite large, either a big Jack or a Red but lost it as well. He and Phillip were both using spoons. Nam saw another Snook hook up that broke off and one real nice Flounder that came over the rails. Mullet were plentiful on the beachside of the north jetty. Between the three anglers, they landed plenty of Ladyfish and Blues. 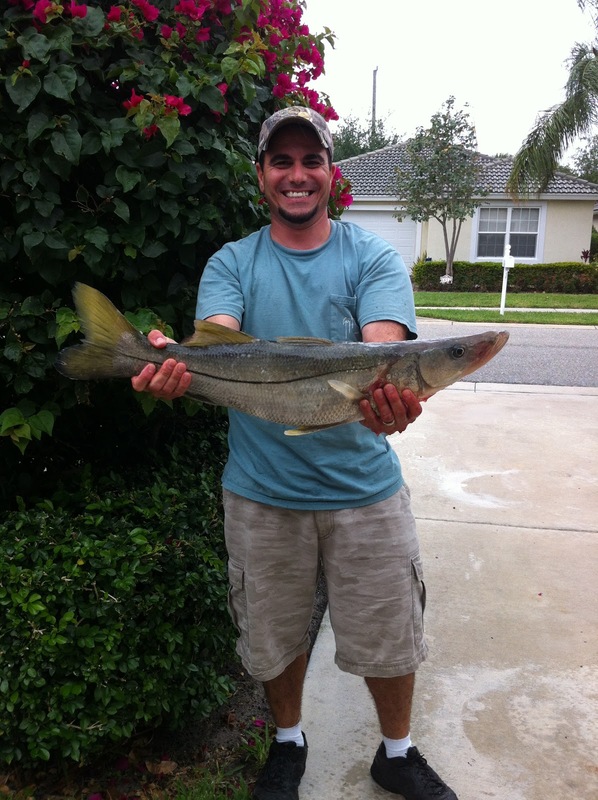 Our angler of the day is David Rhim of Orlando with his first Snook ever, a 29.5" keeper! Talk about beginners luck! David was fishing with Nam Bui and landed this beauty on slack tide prior to the outgoing, using a bucktail. wind, east wind, no wind as I said it was all about the day and where you were fishing. West wind made for some excellent surf fishing or locating Red fish on the west side of the Indian River, east wind found many anglers targeting Trout on the east side and off shore it kept anglers on their toes. Wind has been mild, excellent fishing and it kept the bugs away. Surf anglers it has been Pompano from Hobe Sound beach to Fredrick Douglas access in Ft. Pierce, that is a lot of Pompano. Bite times were changing but a little time in the area and it was a sure catch. Strong reports from both locations mean there has to be some in between, so a little patients will find them. Blues are still with us in numbers, fish early, cut baits will find them, 2 to 4 pound fish excellent table fare. Did not hear much about Whiting,sort of got lost in the Pompano and Blue fish but I know they are there, a pitch not a cast will get you in their zone, up close, in the first trough and good size, a good week for surf anglers. River anglers depending on the day, Red Fish bite was excellent from Midway road south with the west wind, no turbity, fishing the docks found plenty o slot fish on baits that run below the surface. Two hour later you were on the east side catching slot Trout with the same baits the cool part was the Flounder on both sides. Not a lot of Flounder but all were pleased to catch one or two, not being the target it was a nice treat. From the bridges it was Drum and Sheep head on clams, they were chewing the barnacle off the pilings, match the menu. Still Blues and Mac’s with a mix of Snapper and Jacks, Lady fish and more Flounder, it has been a good week of fishing no mater the time. Inshore, the end of last week was good for trout, snook and redfish on the flats around Ft. Pierce and the lagoon. This is a good time of year for you to get your fly rod out and hit the flats for some exciting action around the docks along Indian River Drive on the west side. Kadri Benton reported some good snook action on the south jetty overnight. Anglers were finding success on red tail hawk type jigs, live greenies and live pilchards at the end of the out going tide. Boy I Feel "A GREAT SPRING & SUMMER"
We have another gorgeous morning at the inlet. Winds are blowing out of the West at 5 mph and the water is clean and calm. Yesterday, Blues abounded and about mid-day, a big school of Jacks came through according to Walton Ray at the Sebastian Inlet Bait and Tackle Shop. Walton heard, but did not see two Permit that were landed off the north jetty. A variety of fish in small numbers have been landed the past few days, so it is a possibility. We understand that the Snook and Red bite has been more active in the evening hours. Photo today is of Dustin Baird with a beautiful 29.5" slot Snook he landed on a bucktail on the north side at night. For the Inshore anglers the water has been clean with an abundance of bait. Redfish have been found around the west bank north of the power lines. Large snook have been found all over the flats from the west bank all the way to north bridge. Trout have been caught under the mullets schools all througout the river. Feather fishing has been good with fish being caught in the inlet on the incoming tide. What a gorgeous morning at the Sebastian Inlet! Winds are blowing out of the West-Southwest at 4 mph and there is a light ripple on the water. Fishing has been slow with a variety of species being landed in small numbers. The only thing biting off the north jetty yesterday morning were small but keeper sized Blues according to Mike Ricciardi of Vero Beach who fished from 6:00 - noon. Mike was targeting Pompano and was using clams and dead shrimp, but Blues will normally take just about anything, he limited out with 10. Mike reported that Spanish Mackerel were breaking the water feeding on small bait fish but none found their way to the north jetty anglers. Our first photo is of Mike with his catch of Blue fish.Photo two is of Russell Terpening of Palm Bay with decent Flounder landed off the north jetty. Russell had one finger mullet to use for bait and the rest were pinfish. When he threw the finger mullet out, it was hit immediately by this nice Flounder. Russell may have spent the rest of the morning trying to disguise pinfish to look like finger mullet! Photo three is Vinh who landed and released 2 undersized Snook using a swimming plug; he is featured with a 24" Snook prior to its release. Photo four is of two unidentified anglers fishing the rocks of the Tide Pool on Tuesday. The photo was taken from the south side of the inlet. Mother Nature threw another weather front at us this past week. Lots of winds and some much needed rain blew into the area. It kept us off the water a couple of days, but it was good to see the grass and plants smile for a change! We have one more on the way bringing cooler weather to take April out with some gusto! Redfish and trout were our main targets again this week. There are some big trout on the flats and we found our share of them in two to four feet of water. Our best bite has been south of Fort Pierce on the east shoreline. We have been fishing the sand holes on the flats to find the trout. CAL jerk baits, live bait and top water lures can all get you in on some of the action. We have found some redfish on the same flats and along the mangroves. CAL grub tails, gold spoons or live baits can help you find a slot redfish on the flats this time of year. Allison hooked up on three reds, but only got one to the boat. Fishing continues to improve on the flats. It will be a fantastic summer out on the water! 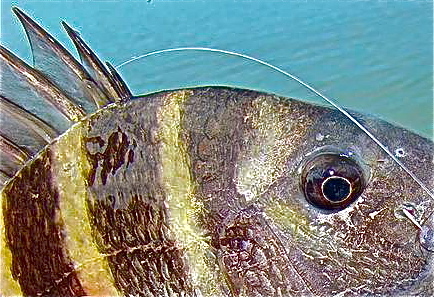 Sheephead, black drum and some snapper can be found around structure and the bridges using live or dead shrimp. Jacks, mackerel and bluefish have been hanging around the jetties and inlets. Small shiny lures work well on those fish. We even caught a 26" gag grouper on the flats this week. It's been fun out there in spite of the windy conditions. Things will begin to calm down soon and we can enjoy the warm summer months on the flats. This late season cold front should be our last one and we can have fun fishing the flats! It's a beautiful morning at the inlet. Winds are blowing out of the Northwest at 3 mph and there is a light chop on the water. Fishing was slow yesterday but the water was clean and blue, the skies had big, white, fluffy clouds and a cool breeze made it a wonderful day to be at the inlet. We expect a repeat today! A small variety of fish were landed yesterday, but it was a VERY small variety. Flounder, Spot Porgys, Spanish Mackerel, Jacks, small Mangrove Snapper and Sheepshead were landed on both sides of the inlet. Evenings have been more active for Snook and Reds. Our photo today is of Terry Tates of Ft. Myers he landed this beautiful, 25" Spanish Mackerel. The inshore fishing should be turning to the summer patterns as the water has been warm most of the winter and this will make everything happen earlier. Look for a good trout and redfish bite on the flats. Try using a soft plastic bait like a D.O.A. Shrimp or a C.A.L. in a light color early in the day and then go to live baits like white baits or a shrimp. Try places like the Moorings Flats, Harbor Branch or from Bear Point south to Herman's Bay. Look for the snapper to move into the Ft. Pierce Inlet and along the channel edges. A small live shrimp will be your bait of choice. 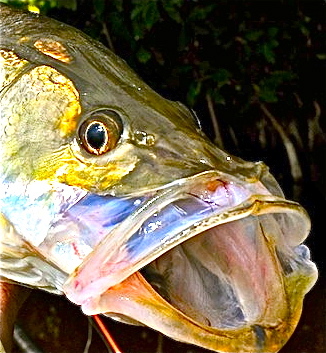 The snook bite should also be good around the Turning Basin and at the area's bridges. Try using a live pinfish or pigfish and fish around the fenders of the bridges. 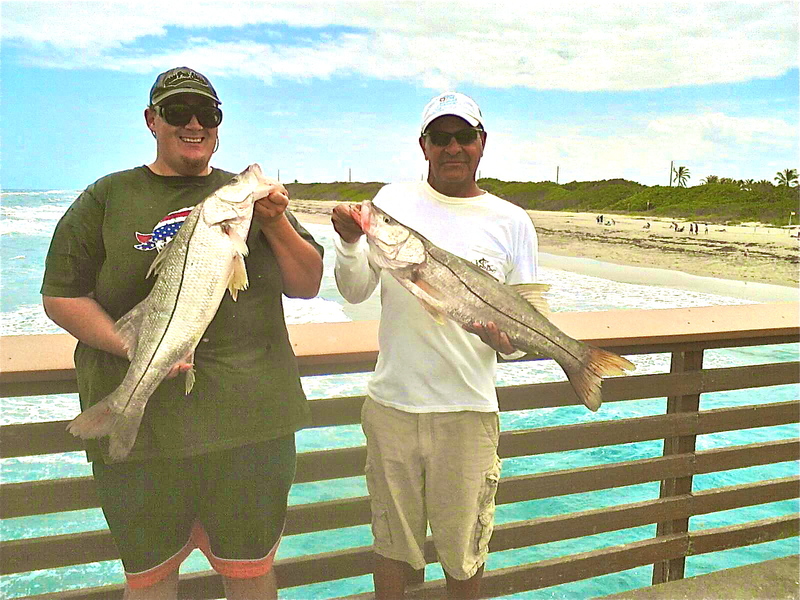 Inshore, snook fishing has slowed a little at the south jetty in Ft. Pierce. Kadri Benton reported a big crowd at the jetty prevented him from finding much action on snook overnight. Capt. Scott Crippen reported a good day in the lagoon for snook, redfish and trout on fly yesterday morning. These are photos from one of my fishing buddies (well maybe not anymore) "George", who's been doing alittle fishing without me..... All he's saying is they where caught in the Stuart area ???????? Blues were biting pretty well from the beach and some big Jacks were in play as well. A variety of species in ones and twos are being landed, it's just being in the right spot at the right time! Sheepshead, Flounder, Spanish Mackerel, Mangrove Snapper, Snook and Reds are out there but haven't been hitting much. Our angler of the day is 10 year old Aiden Campanelli of West Melbourne. Aiden landed this nice Sheepshead using live shrimp on from the Tide Pool rocks. Aiden and his older brother landed a couple of other keeper Sheepshead and some Mangrove Snapper that were right on the border, so they released them to grow up a little. Inshore, snook fishing has been a little on the slow side over the last few days. Snook have been taking jigs after sunset and live pinfish, shrimp and pilchards during the day. Trout fishing in the lagoon has been typical for spring time fishing, you will want to fish early in the morning to find a good bite for trout and redfish. Soft plastics and spoons have been working well for the trout and redfish. Try a top water plug for the gator size trout also early in the morning. The south jetty at Ft. Pierce has been producing catches of black margate, jack crevalle, bluefish and few snook on live shrimp and jigs. The trout bite has been steady around spoil islands, and sandbars using DOA or live shrimp. At night around docks, bridges, and structures snook have been feeding on live bait. There has also been some reports of flounder around the flats using jigs and reports of scattered jacks. The sebastian riverhas been a popular get a-way from the wind. The Tarpon roll back there has been red hot. Stay to the North just before the railroad bridge. Lots and lots of bull shark have made the Sebastian river their home the last couple of weeks as well! 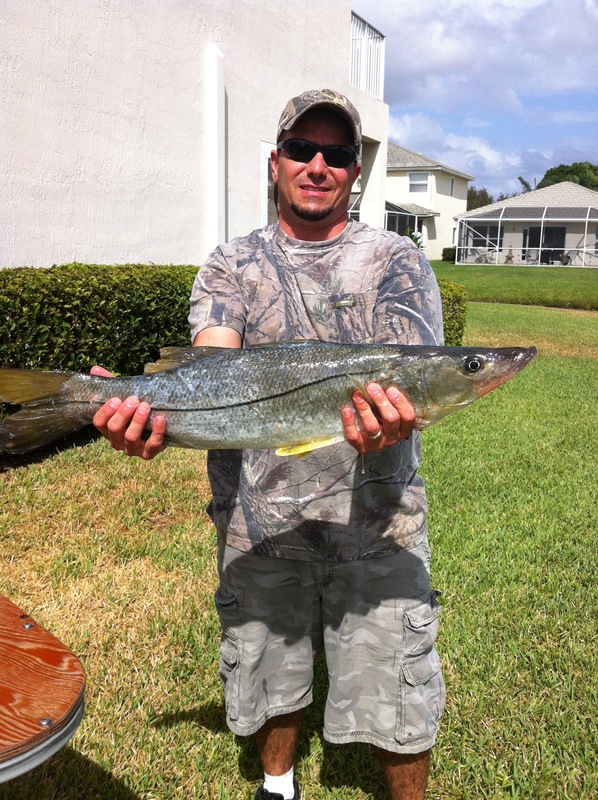 Inlet regulars have reported that slot-sized snook are being caught daily, at night using live bait. There has been several over sized red's being caught also.. Black drum, sheepshead, and pompano being caught off the catwalk on the south side. Reports of pompano are being caught off the beach, using Doc's Goofy Jigs. The color of the week is yellow and white. Most guys have had great luck North of the Sebastian Inlet! Spanish Mackeral, Whiting, and Jacks are also being caught very close to shore! The spinner sharks are here if you like to shark fish! Winds are blowing out of the North-Northwest at 13 mph this morning and the water is choppy. There is a small craft advisory in effect until 10:00 a.m. this morning. Tommy Turowski at the Sebastian Inlet Bait and Tackle Shop gave us an update and said there wasn't a drop of rain, all weekend! Fishing remains on the slow side. Blues and Jacks came over the rails in the largest quantity this weekend. A smattering of Snook, Reds, Sheepshead and Flounder were landed as well. Our angler of the day is Matt Quickel with a real nice Flounder he landed. Matt landed this sweet Flounder in the inlet on a pinfish head. Photo two is of unknown anglers fishing the Tide Pool. "Sorry" this is a photo that I took last week and kind of lost it... but now I have it back and here it is. A nice Pompano from Juno Pier. They are catching a few with some cobia crusing through also. Inshore fishing has been good, with large trout and redfish all along the east bank from Fort Pierce to Vero. The snook fishing in the inlet has been good with fish being caught on live bait, bucktail jigs, also Geoff even caught a large snook on fly in the inlet. Made of durable vinyl, the Snap Shot is simply a soft (easily stowed) ruler with a clip on the top side for attaching to your gripper or scale and a weight on the bottom so that it hangs straight. We recently tried it out on some Nor Cal stripers. With the fish lipped with a gripper, all we did was snap the ruler onto the Boga and then snap a couple quick shots. What’s pretty cool about this thing is you can measure your fish without handling it so much — or flopping it around on the deck — so it’s a handy catch and release tool. Also, it’s good for those of us who are…well…”measurement challenged.” I can give you a pretty accurate estimate of a fish’s weight, but when it comes to it’s length I’m not so good. Unfortunately, I may find out that all those 24-inch trout I’ve been catching in the creek are actually a little shorter than I had thought! I can also see the Snap Shot being useful when you get together with some buddies for a little fun catch & release derby. If everybody has one of these rulers on board, “weigh-in” can be done with digital photos. That way, you don’t have to kill or haul a fish around in the livewell all day. It's another beautiful morning at the inlet. Winds are blowing out of the Southwest at 8 mph and there is a light chop on the water. There is a nice swell for the surfers this morning. Anglers, please use caution when casting off the north side of the north jetty. We wouldn't want you to snag one of our surfers! 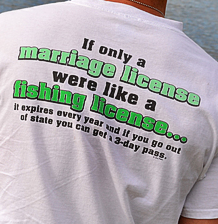 We wish we could bring you better news, but fishing remains slow. We have seen a variety of fish but it's really been hit or miss during the daylight hours. The night bite has been better for Snook and Reds, but many of those have been oversized and returned to the water. We have a good chance of rain both days this weekend, go prepared for it if you head to the inlet. Maybe a little rain will help the bite, who knows? The past few weeks have been odd. Our angler of the day is "Frenchie" of Vero Beach. Frenchie was fishing the south catwalk when he landed this good sized Flounder using live finger mullet. For the inshore fisherman there is good clean water on the incoming tide with quite a few smaller snook around the lights at night. 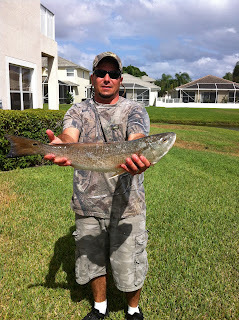 There has also been a great trout bite along the west bank from south Fort Pierce all the way to Vero. With the occasional redfish mixed in as well. I want to thank all the people who showed up to my seminar last night. I hope you picked up a Tip or Two. Thursday the 19th, I will be doing a seminar on "WADE FISHING"
Another blustery week along the Treasure Coast had anglers searching for ways to get out fishing and not get blown away! We found a number of areas to fish this week to get out of the worst of the winds. It's been a challenge, but we have caught fish each day out there. There is a slimy seaweed to the south of Fort Pierce that makes it almost impossible to fish some areas. We get this every year about this time and it can really mess your day up. Bear Point has been one of the worst areas on the outgoing tides. As the tide rises, it will push it away so that you can fish that area for a while at high tide. There is some of this to the north of Fort Pierce, but not nearly as bad though. We have been fishing up north all week. Trout are on the flats, it's just a challenge on many of the usual flats for now. The trout we have caught are nice sized ones. CAL jerk baits, DOA shrimp and live baits have found us some nice trout most days. We are still getting some redfish around the mangroves on CAL grubs and live bait. Most of the snook have been caught around the inlet, bridges and jetties on live bait or feather jigs. Sheephead are still hanging around most structure along with some black drum. The beaches have been unfishable most days, but you can find whiting, bluefish and possibly some pompano when you can get out there. The jetties have held bluefish, jacks and mackerel on most days. We still have a few weeks to deal with the windy days so plan your trips around the conditions to have the most fun and the best opportunity to catch some fish. A beautiful week of sunshine and temperatures that are easy to live with, along with that came the sea breezes keeping most happy. Problem, breeze, wind would be a better decryption, from the east at 17mph has made the seas less than polite, put chop on the river and made the surf a hard scene. But what can I say other than it has made some beautiful days just hard on anglers. Surf has been real hard scene and the Snook fishing has been red hot. This species likes a strong current and they have been eating any thing that swims, best part is they have been slot fish. Yes, you are going to get wet, you will be casting north and south these fish are in the trough just waiting for the surf to over power little fish and you need to be there, Bombers, Krystal minnow, DOA Baitbuster will get their eye, if your bait stops set the hook. Still some Blues on cut baits, Pompano in and out all day eating clams and sand fleas, lots of fish at the beach guys, come on down. East wind means east bank of the Indian River, look for the flat water that is where the bait is and that is where the action is. Fish shallow the fish are in there hiding from the bottle nose Dolphin, shallow is their safety. Lots of Trout, most at the top of the slot or over with a mix of Blues, Jacks, Lady fish to keep you busy,noisy top water baits have taken their toll. Plenty of Snook, pick a bridge and wait for the sun to go down, Flair Hawks will get you to the zone in this strong water. Roosevelt Bridge for the big Snook, bring your camera these fish will all be over slot. Has any body tried fishing those monster Jacks on the west side closer to the marina ? One of the great thing about the North Fork is , “what wind”. This morning winds are blowing out of the South-Southeast at 13 mph and there is a moderate chop on the water. Fishing has been slow. A few Blues, Spots, sporadic bites of various species but overall a big letdown. This isn't spring fishing as we've known it in the past, that's for sure! We have another breezy morning at the inlet. Winds are blowing out of the South-Southeast at 18 mph and the water is choppy. Although the weekend was breezy, the fish were biting; particularly Blues. Tom Turowski at the Sebastian Inlet Bait and Tackle Shop reported that a lot of Blues came over the rails along with a smattering of everything else. There aren't many folks out on the north jetty this morning but the Pelicans are actively diving, so fish are out there. 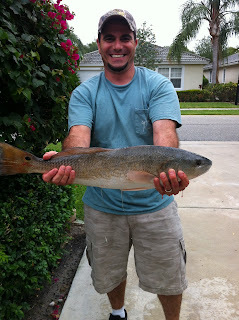 Photo one is of Tony of Orlando with a big catch and release Redfish he landed using cut pinfish. Photo two is of an unknown angler on the tip of the north jetty, braving the wind and waves! 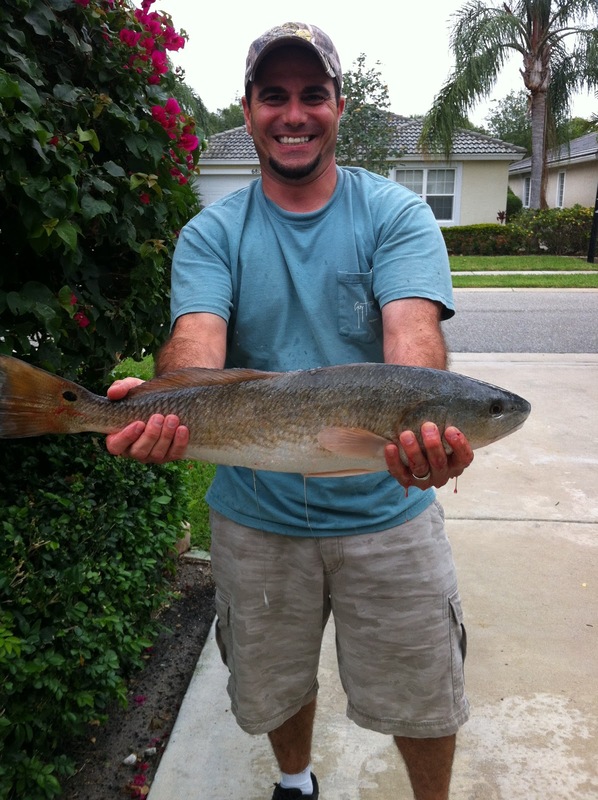 Inshore fishing has been good with reports of Trout, Redfish, and Snook on the east bank by the power plant. There was also reports of large Sawfish near Jaycee Park, and one caught in Sebastian Inlet while shark fishing. This morning winds are blowing out of the East-Southeast at 15 mph and there is a chop on the water. There is a small craft advisory in effect through Saturday evening but will probably extend through the weekend. Always check the coastal forecast before venturing offshore. Fishing was on the slow side this week. Early in the week the weather was beautiful and we saw Spot Porgy's, a few Blues, a couple of over and undersized Snook, some big schools of Jacks and a lot of Ladyfish in the evenings. Things started improving when the wind picked up yesterday with a nice steady Bluefish bite and stragglers of various species here and there. We are hoping the change in the weather pattern will help invigorate the bite for all you weekend anglers out there! Our first angler is Sebastian Inlet State Park (SISP) Ranger Brian Cole with a real nice Flounder he landed after work. Brian was using mojarra to land his fish.